In connection with the Civ at the MOA website, the MOA will showcase original works on paper in the Print Study Room on select dates each fall and winter semester for open viewing and study. This resource is designed specifically to give GE teachers more ways to engage with the MOA’s permanent collection. Normally open by appointment only and located on the lower level of the MOA, the Print Study Room will be open Monday-Thursday from 10 AM to 4 PM during these weeks for faculty and student convenience in seeing these works (Tuesday – Friday on select holiday weeks). The Print Study Room is located on the lower level of the Museum of Art by the Electronic Gallery around the corner from the restrooms and glass display case. Individuals should check backpacks at the front desk of the Museum on the main floor, as they are not allowed inside the Print Study Room. Pencils may be brought into the Print Study Room. Prints by the celebrated seventeenth-century master Rembrandt will be on display in the Print Study Room. Few artists captured the emotion and psychology of his subjects as Rembrandt van Rijn (1606-1669). One of the great religious artists in western history, Rembrandt used the distinct techniques of the etching medium to bring new relevance and accessibility to revered sacred themes as well as the images of daily life. Click here for image list of Dürer and Rembrandt prints. 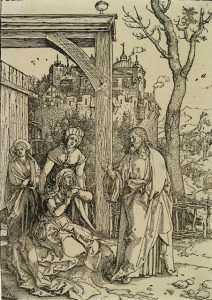 Image at left: Albrecht Dürer (1471 -1528), Christ Taking Leave of His Mother (The Life of the Virgin), c. 1507, Engraving, Brigham Young University Museum of Art, purchase/gift from Mahonri M. Young Estate. The BYU Museum of Art’s print collection boasts examples of many prominent art styles of the 20th century, including Cubism, Pop Art, German Expressionism, and Surrealism. Artists such as Pablo Picasso set the stage for a century of experimentation and innovation that explored how space, emotion, and popular culture could be reflected in art. Click here for image list of Modernist prints. Image at left: Kathe Kollwitz (1867-1945), The Widow I, Brigham Young University Museum of Art.